The Ed.D. in Adult and Lifelong Learning degree prepares students for employment in programs that provide adult literacy and education, lifelong learning, community and nonprofit organizations, military education, postsecondary education, and continuing professional education. Coursework focuses on the assessment, design, and implementation of educational programs for adult learners at all stages of development. The doctoral program requires 96 credit hours of graduate coursework, but 42 hours of master's degree coursework can be counted toward the 96-hour requirement. Assess the educational needs of adult learners in a myriad of adult and lifelong learning environments. Develop and implement procedures to assess learning needs for adult learners. Create and design instructional programs aimed at meeting the needs of adult learners. Demonstrate leadership and management skills applicable to the organization and administration of adult and lifelong learning programs. Apply problem solving skills in order to research and evaluate the impact of adult and lifelong learning programs on participants. The ADLL Program is an executive, cohort-based program that admits new students every two years. ADLL blends online instruction with on-campus meetings. Students progress through the program as a learning community, taking approximately 6 hours (2 courses) together each semester. Four (4) weekend, on-campus meetings are scheduled during Fall and Spring semesters. o These should be submitted to the Chancellor of the Institute. The final step in the process is the candidate interview. Candidates selected for an on-campus interview with the graduate admissions committee will be notified by the Graduate Coordinator. All applicants are notified regarding acceptance status within two weeks of the initial interview. *Students who do not hold a master's degree in adult education may select electives from coursework applicable to the M.Ed. in Adult and Lifelong Learning or may take courses from related areas of study with consent of their advisor. ADLL 6413 - Quantitative Reasoning in Adult and Lifelong Learning - Methodologies for designing descriptive, correlational, and experimental studies. Development of research questions, definition of variables, selection or development of instruments, data collection, analysis, interpretation and reporting of research results. § Discuss theoretical perspectives and orientations associated with quantitative paradigm. § Identify accepted elements of quantitative research design. § Discuss and differentiate the differences among the types of quantitative studies. including descriptive, correlation, and experimental. § Formulate research question appropriate quantitative research design. § Evaluate data collection instruments associated with quantitative research questions. § Analyze quantitative data using appropriate statistical techniques. § Report research results using appropriate data display techniques. ADLL 6423 - Qualitative Reasoning in Adult and Lifelong Learning - Methodologies for designing qualitative research studies in adult and lifelong learning settings. Selection of the appropriate qualitative tradition, selection of research subjects, development of data collection protocols, field work strategies, data analysis, data interpretation and presentation of data results. § Discuss theoretical perspectives and orientations associated with the qualitative paradigm. § Develop a data collection protocol (i.e. interviews, observations, document analysis) acceptable for use in qualitative research settings. § Analyze qualitative data using appropriate coding strategies. ADLL 6433 - Program Evaluation - Overview of evaluation strategies in adult and lifelong learning programs that include: development of evaluation questions, selection or development of instrumentation, data collection methods, data analysis, and reporting of evaluation results. Emphasis on practical and ethical issues associated with evaluation processes. § Describe and explain differences between program evaluation and educational research. § Implement evaluation of an adult and lifelong learning program and issue a report of evaluation findings to the program stakeholders. ADLL 6443 - Adult and Lifelong Learning Dissertation Seminar - Development of dissertation proposal. Formation of research question, selection of methodologies, development of problem statement, research questions, and identification of research variables, constructs of phenomena. Identification of data collection and data analysis procedures. § Identify an appropriate theoretical framework which grounds dissertation research. § Describe instrumentation procedures for their research. § Outline, explain, and defend data collection methods for their research. ADLL 6113 - Advanced Adult Learning Theory – Advanced study of theories and models of adult and lifelong learning with an emphasis on current trends, recent research, and issues affecting the field. Issues covered will include critical theory and advancements in neuroscience and cognition as they relate to adult learning and lifespan development. § Compare and contrast the contributions of seminal adult education theorists. § Discuss and analyze critical theory of adult education. § Evaluate theories and strategies for developing adult learning programs based upon recently published empirical studies. § Demonstrate how emerging interdisciplinary research (i.e. neuroscience, lifespan development) informs the practice of adult education and how it supports/refutes the contributions of major theorists. ADLL 6123 - Leadership and Ethics in Adult and Lifelong Learning - This doctoral course focuses on leadership principles and ethical considerations that are critical to developing and sustaining adult education programs that benefit individuals, organizations, and communities. Course content will include case study analysis and lectures from scholar-practitioners from the field. ADLL 6133 - Analysis of International Adult and Lifelong Programs – Survey of the historical and philosophical events which have shaped adult and lifelong learning worldwide. Discussion of issues affecting adult education and lifelong learning including globalization, educational access, and variance in national policies. § Explain the impact of historical and philosophical events which have affected adult and lifelong learning. § Distinguish how adult and lifelong learning practices differ based upon a nation's political structure, economy, and cultural norms. § Describe and explain the affect of United Nations Educational, Scientific and Cultural Organization (UNESCO) and the World Bank on adult and lifelong learning practice. § Examine how adult education and lifelong learning practices are effected by globalization, the market economy, environment, and health. § Identify and explain how adult and lifelong learning programs assist marginalized populations and lead to community empowerment. ADLL 6143 - Instructional Adaptation and Innovation in Adult and Lifelong Learning – An overview of teaching and learning methods, styles, and techniques which are applicable when facilitating adult learners across diverse settings. Content to include teaching and learning style assessment, accommodating learning styles, physical and learning disabilities, language differences and cultural norms. § Identify and describe different systems of teaching and learning styles. § Explain how different teaching and learning styles can be applied to adult and lifelong learning settings. § Identify appropriate teaching styles which address needs for adult learners with physical or learning disabilities. § Describe the influence of language differences and cultural norms on an adult learner's ability to process and understand. § Demonstrate the ability to assess an adult student's learning style. ADLL 6153 - Policy and Public Governance of Adult and Lifelong Learning Programs – Policy analysis and public governance issues in adult and lifelong learning with emphasis on state and federal programs. Discussions of how to evaluate, design, and implement policy focused on promoting adult and lifelong learning activities in a myriad of organizations. Overview of trends and current issues related to policy and public governance of adult and lifelong learning. § Examine current state and federal policy and law regarding adult and lifelong learning initiatives. § Evaluate how federal policy informs practice at the state level and how state level policy informs practice at the local program level. § Consider policy changes needed to enhance the accessibility and sustainability of public adult and lifelong learning programs. § Review recent empirical research which should be considered when developing policy related to adult and lifelong learning programs. Develop recommendations to apply those research findings to practice. ADLL 6163 - Adult Development and Psychology – Focus on adult developmental psychology with emphasis on lifespan development and specific issues related to learning in the various stages of adulthood. Work-life balance, meaning of work, generational issues. ADLL 6173 - Current Issues - Exploration and discussion of current issues relative to adult education and lifelong learning. Focus on the review and application of current research as it relates to practice. May be repeated twice. ADLL 6313 - Independent Study - Independent study of topics in adult and lifelong learning. First conference of the 2019. Nicolai Trubetskoy: his influence on phonomlogy, by Sandra Noak. January, 14th, 2019. Room D12. Pr. Sarah Leanard talks. September, 6th, conference on Theatre and education. Loggin for more informations. The next conference about melodrama (Pr. Nick Snider) will be on april, the 10th. "Reeding Benvéniste today", Conference of Pr. John Slo, February, the 3rd. January, the 9th, Pr. Dr. Martin Balmont will propose a conference about "Myth and Platon's Philosophy"
Next issue of the Revue Republican Imagery : Theatre and Education in Antic, Medieval and Modern Europe. The University is proud of the conference it have organized in Paris with Noam Chomsky and Florent Montaclair. Greetings to the French National Library François Mitterrand, the Equipe d'Accueil du CNRS of University Paris 8 and its director Sophie Wauquier, the President of the University of Paris Lumière Pierre-André Jouvet and our colleague of the University of San Diego Dalila Ayoun. Greetings again for Martin Legros (Philosophie Magazine), Olivier Berruyer (lescrises.com) and Annie Lenoir (Centre culturel de Wallonie Bruxelles). A new conference : "Science as common culture", in Paris, Assemblée Nationale, 2016, June, 8th. With Albert Fert (Nobel for Physics), Jean Jouzel (Nobel for Peace), Luc Montagné (Nobel for Medecine). The historical path followed by the International Society of Philology will be proposed again for our next international conference: Mathematics and Grammar. The Winner of The Gold Medal Of Philology 2016 is the French Scholar Florent MONTACLAIR. His works on the relationship between arts and literatures and on the structure of the fantastic serial novel show the link between French and American literatures and between the structure of realistic literatures and fantastic literatures. He is the third structuralist Philologist to win the award and the first French one. The great scholar in sciences in Education, former director of the INRP (French Institute for Sciences in Education), LOUIS LEGRAND is dead. He was born in March, 1921, 12th. The five nominees are selected. A team of University of Michigan paleontologists and an excavator who donated his time worked all day at the site in Lima Township, roughly 10 miles southwest of Ann Arbor and several miles from the town of Chelsea. They were able to recover about 20 percent of the animal's bones, including the skull and two tusks, numerous vertebrae and ribs, the pelvis and both shoulder blades. Paleontology Ph.D. candidate John Fronimos watches as the mammoth skull and tusks are hoisted from the excavation pit. 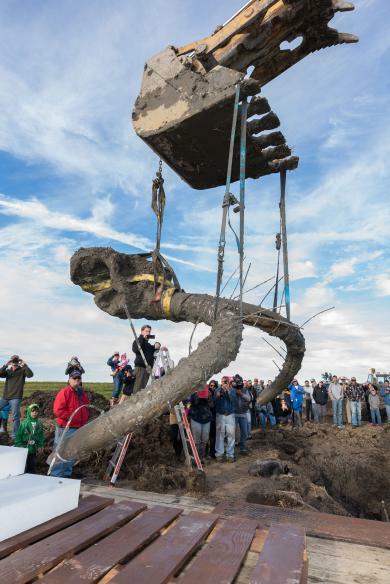 Image credit: Daryl Marshke, Michigan Photography.The bones are from an adult male mammoth that likely lived 11,700 to 15,000 years ago, though the remains have not yet been dated, said U-M paleontologist Daniel Fisher, who led the dig. The site holds "excellent evidence of human activity" associated with the mammoth remains, he said. Come and find out about the treasures of the Sandy Art Collections. Curator Dr Elos Romy will talk about the history of the collections and pick out some of the paintings not to be missed. Open to students, staff and the public. Free and no need to book but if you are travelling by car please e-mail to museum to register your vehicle registration number. John Writ invites students, staff and members of the public to a conversation on Super Furry Animals front-man, Gruff Rhys. Gruff is well known internationally as the lead singer and songwriter for Super Furry Animals, and also for his collaborative work with Gorillaz, Mogwai and Simian Mobile Disco. Gruff will perform selections from his considerable back catalogue and talk about the challenges of being a Welsh speaker and bi-lingual artist in a culture dominated by the English language. This masterclass is a unique opportunity for staff and students from all creative disciplines to engage on one of the UK’s most important artists. New issues of our revue Republican Imagery are published. Copyright (c)2014 University of Philology and Education www.lws.fr | Design by Free CSS Templates.